Online stalking (also known as cyberstalking) is unfortunately not a new phenomenon—websites on the topic dating from the mid-‘90s continue to receive regular traffic. But as modern Web technologies continue to blur the lines between the digital and physical worlds, online stalking is becoming more common and more dangerous. According to the Stalking Resource Center, more than seven million adults become stalking victims every year. One in four of these victims say that they have experienced some form of online stalking. If you’re concerned about online stalking, then you’ll need to take a proactive and preventative approach to your use of the Internet. Using tools such as privacy protection and reputation management, you can both guard yourself against online stalkers and prevent stalking before it even happens. What exactly is online stalking? Before we can delve into the tactics that you can use to protect yourself on the Web, it’s important to understand what online stalking is. In the most general sense, this term refers to the practice of using the Internet to harass another person. Online stalking can take many different forms, including stealing someone’s identity, sending threats, making false accusations about a person online, and following someone’s use of the Web. Whatever tactics online stalkers may use, they typically employ a wide array of tools to get the job done. A staggering 83 percent of cyberstalking victims report that their stalkers used email to contact them. Another 35 percent reported that they had been stalked through instant messaging. Social media is another common instrument of online stalking. Most commonly, users call it “stalking” when they closely follow others in their network. However, this type social media stalking is not always malicious. Many people use Web searches as an innocent way to feed their curiosity about others online. But there are still others who do use the Internet for cyberstalking, which has far more serious implications for victims. Who is most affected by online stalking? Advocacy group Working to Halt Online Abuse (WHO@) publishes comprehensive statistics on cyberstalking and online harassment. According to this information, victims of online stalking are spread evenly across all age groups and are most likely to be white females, although over the past decade the number of males being stalked online has almost doubled. In addition, the percentage of Asians and African-Americans affected by online stalking has grown annually since WHO@ started keeping records. An estimated 1 in 12 women in the US has experienced stalking either online or offline. Victims of stalking are also more likely to know the perpetrator than one may think. Nearly 75 percent of those affected by this crime knew their stalkers in one way or another. Of this demographic, those who have been victims of domestic violence are the most vulnerable when it comes to online stalking. But the bottom line is that the prevalence of the Internet and other technological advances has made it possible anyone to become a victim of online stalking at any time. Whether you’ve attracted the ire of a disgruntled former employee or simply separated from a romantic partner, it’s easier than you may realize to fall victim to one of these online perpetrators. As such, taking steps to protect yourself against online stalking is crucial. There are two types of online stalkers: one-time offenders who develop an obsession, and serial stalkers who constantly seek out new victims. Cyberstalkers are almost evenly split between men and women, and slightly over half know their victims personally beforehand. Many websites give sensationalist descriptions of online stalkers as social rejects who never leave their homes and live in filth. Although this may describe some serial online stalkers, the vast majority of stalkers seem like nice, regular people at first glance. Some may even be coworkers or members of your own family. Over time, cyberstalkers become increasingly jealous and demanding, and they try to make you feel guilty for not fulfilling all their desires or for spending time on other activities and people important to you. To achieve their goals, cyberstalkers can take advantage of Web 2.0 technologies to tarnish your online reputation. Online stalkers may try to coerce you into doing what they want by publishing defamatory, malicious information or private, personal data that can hurt your online reputation, your relationships and your professional career. This is the type of online stalker that you will see most frequently. It’s common for former romantic partners to have a difficult time accepting the end of a relationship. As a result, they may begin to stalk their exes online in secret. Using harmful tactics such as threats, public humiliation, or even statements of love, these individuals will usually attempt to either hurt their former partners or try to regain their love. Some exes will also begin to harass their victims’ friends or new partners as a way of achieving their goals. There are some online stalkers that build one-sided relationships with their victims and do anything they can to elicit a response from them. As a result of their obsession, these perpetrators believe that the behavior they exhibit will lead to their victims ultimately reciprocating their feelings. 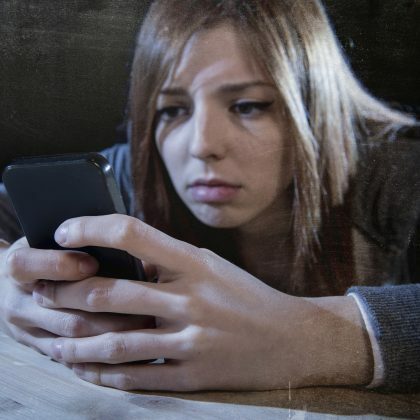 Typically, these stalkers will become extremely demanding and react angrily when their victims receive communication from anyone else in their lives. A more unpredictable form of online stalking, retaliation often comes as a result of an exchange gone wrong. Perhaps a victim accidentally offended an acquaintance or simply got into an argument with someone. Whatever the cause may be, these stalkers may target their victims with angry messages and emails. Sometimes, they’ll even threaten them with violence. Online stalkers who are out for vengeance also commonly seek the personal information of their victims so as to damage their character and reputation. Unlike the other types of online stalkers, trolls send harmful or violent comments to their victims for seemingly no reason. Sometimes, they seek to cause harm without their victims even knowing that it is happening. Whether they’re copying behaviors or posting death threats, trolls are among some of the most dangerous varieties of online stalkers. How can you tell if you have an online stalker? The best protection is to prevent online stalking before it even happens. Online stalkers can’t damage your online reputation if they can’t find you online. By taking a few privacy-protection measures, you can significantly reduce the chances of being stalked online. These sites, which are also known as people-finder databases, collect personal information and publish it, thus facilitating Internet-based reputation smearing by cyberstalkers. You can, however, opt out of many of these sites and keep your info from falling into the wrong hands. Passwords are what keep online stalkers from accessing your accounts. As such, you should always use passwords that are as unique as possible, with security questions that are difficult to answer for anyone who isn’t you. Moreover, you should use passwords to protect every account that you have, whether it’s for credit cards, social media, or your bank. It’s also an excellent idea to change your passwords at least once a year—and even more frequently if you’ve just separated from a romantic partner. Online services are constantly changing their privacy policies, so you should keep an eye on your own privacy settings to ensure that they’re protecting your info. Look to see who has access to your data. Can only your friends view your personal info or can anyone from the general public see what’s in your account? Googling yourself is an effective way to see what kinds of information you can find about yourself on the Internet. You should search for yourself in several different capacities. Start by Googling only your name, then add your phone number, date of birth, or address and try searching again. If you find information that you don’t want appearing online, then you should contact the administrators of those webpages and ask them to take the content down. Removing this info will make it more difficult for online stalkers to find and share things about you on the Web. First of all, if you perceive an imminent threat to your safety at any point, immediately contact law enforcement. If the situation hasn’t escalated to that point, you should start by giving the person a firm “no,” telling them to stop, but only do this once. After this, you should stop responding to his or her messages. Don’t attempt to engage again in any way. Throughout this exchange and beyond, you should document all incoming correspondence, including emails, instant messages, and voicemails. Consider a service such as ExecutivePrivacy by ReputationDefender. This is a comprehensive privacy protection tool that removes your personal information from the vast majority of Internet data brokers, making it much harder for a stalker to track you down. Schedule a free consultation using the form below, and we’ll be happy to give you personalized advice. Never hesitate to inform your friends and family if you know you have an online stalker. Only by understanding the issues at hand can they offer their support during such a frightening experience. You should also ask them to take a look at their own online profiles and determine what they are saying about you to other users. If you’re worried that your online stalker may begin to attack you at work, then you should also inform your employer about the situation. That way, if your stalker begins sending demeaning messages about you, he or she will be able to take your side. Telling your employer about your online stalker can even help minimize the damage made to your professional life. The tips and resources above can effectively deal with online stalking by strangers, but nothing can completely prevent cyberstalking by colleagues, acquaintances, or family members. And unfortunately, these threats are growing as the Web becomes more social. If you’re unable to deal with an incident of cyberstalking on your own, ask for help. You should contact law enforcement as soon as you perceive any type of imminent threat. Forward your documentation on the stalking to the police, ask for a restraining order, and talk to the authorities about resources in your community that can assist you.